I was first exposed to agave by Dr. David Jubb who espoused its health benefits years ago claiming that it was low glycemic. My former company Nature’s First Law/Sunfood Nutrition (whom I no longer represent) and I sold different forms of agave for years. Originally, the agave was supplied by Joanne Cuddigan and David Korn of Holistic Enterprises. Eventually, the agave was supplied by Christopher Daugherty of Essential Living Foods who eventually had to admit that the agave was in fact cooked and not a raw-food product. According to various raw-food websites and www.foodprocessing.com, agave is cooked at 140 degrees Fahrenheit for 36 hours. Years of anecdotal feedback about agave and subsequent testing by Dr. Gabriel Cousens indicated that various yellow agave syrup products were, in fact, not only cooked, but high glycemic. Then Robert Williams, the product sourcing professional for Ultimate Superfoods, gave me his take on agave. He claimed that high fructose corn syrup in the form of broken Mexican sugar candies were being added back into agave syrups and nectars. He brought to light that his research indicated that agave was heavily controlled by at least two very serious and very dangerous tequila mafias and that most of the products on the market were a complete fraud. Upon finding this out, I recommended that my business and I go only with Ultimate Superfoods clear (high inulin) agave (www.ultimatesuperfoods.com). Even though Ultimate’s product is not a cold-processed product, it was still the best product on the market as far as I could tell. My business partner (now former business partner) strongly rejected this plan causing at least one of the major rifts that caused me to exit my old company Sunfood Nutrition. Currently Ultimate Superfoods claims their clear agave is around 50% fructose with a few percentage points of glucose — the rest being inulin. This is the claim, and only a chemical analysis will confirm if this is accurate. And that's where I am at with any claim — chemical analysis is what we all require as proof now. Agave products originally began to be consumed as a New World beverage in ancient times, probably in Mexico. The agave plant (sometimes called “The Century Plant”) is a very hardy desert succulent that has been categorized in its own Linnaean Family, now termed the Agavaceae. After about ten to twelve years, the edible agave varieties (blue agave, etc.) begin to develop a large fruiting stem at their center. This stem grows very strongly and rapidly eventually opening up flowers in its upper reaches that after pollination (usually by hummingbirds) turn into seeded fruits. The shape and structure of this flowering and fruiting stem is so unique that they were used in the background of original Star Trek episodes as alien plants on alien planets. The dried agave fruiting stems are often cleaned out, polished, and turned into didgeridoos. Historically, the center-growing stem, once it began to form, would be cored or cut out. This would cause the agave to bleed a thin milky sap that was captured in a bowl each day. According to research done by author Jonathan Ott (and cited in my book Naked Chocolate), agave (once cored) can bleed 1,000 liters of liquid sap in the two months that it takes it to finally die. This is a huge amount of liquid to be liberated in a dry desert (like finding a spring). This thin milky sap would typically ferment forming a very popular beverage in ancient Mexico known as pulque. To see agave sap being collected, watch this video. Pulque, a mildly alcoholic wine, is the original beverage, consumed right alongside chocolate drinks on the streets of Mexico City for over a thousand years and probably much longer. Processed pulque is still available today in nearly all major Mexican cities and in Los Angeles. According to Dr. Robert Lustig, fructose is to blame for agave’s blues. Ten years ago, sucrose was the enemy. So which one is it? Sucrose or fructose? Over the last 40 years, sucrose consumption has actually been going down and fructose consumption has been going up. Obviously, obesity in the West has been increasing, and Dr. Lustig of UC San Francisco claims that the primary culprit is fructose. To see Dr. Lustig’s presentation on fructose, click here. Fructose is a sugar that is 1.73 times sweeter than sucrose (Source: Wiki). Like glucose and sucrose, fructose is known to be food for candida albicans and cancer cells. Sugar in many of its small and medium chain carbohydrate forms has been reported to rapidly elevate blood sugar levels causing the small gland known as the pancreas to secrete insulin to control blood sugar levels. Due to the intensity and quantity of sugars and carbohydrates being ingested daily by people all over the world and also due to the lack of minerals available to feed the pancreas so it can do its job properly, human metabolism begins to malfunction. This begins as mood swings and ADD symptoms in children as well as obesity, and eventually develops into hypoglycemia and/or diabetes. Hypoglycemia occurs when blood sugar sharply drops after an overproduction of insulin; causing low energy, mood swings, and intense hunger. Diabetes occurs when an underproduction of insulin causes blood sugar to elevate wildly; causing excessively sweet urine and body fatigue. Diabetes can eventually lead to demineralization, diabetic coma, and even death. Natural fructose in fruits and honey is bound to other sugars and is therefore less glycemic and more natural than free fructose. High fructose corn syrup and common agave products contain free fructose. This free fructose appears to be the primary focus of the current controversy about sweeteners. According to Dr. Mercola, fructose, and especially free fructose, in quantities greater than 25 grams a day can cause an unhealthy increase in uric acid production, lead to weight gain, and, as Dr. Mercola told me in a private conversation, can become a major contributing factor in the development of a fatty liver. I have been to agave processing facilities in Mexico where Tequila is made. 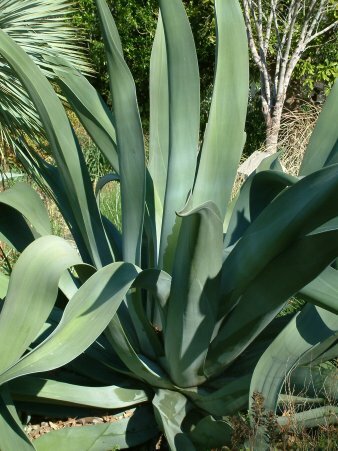 When the agave plant is mature (just as it starts its flowering stage) they trim off all the succulent and barbed leaves of the agave plant until it looks like a giant pineapple or the fruit of the pandanus tree. They then wrap a chain around it and tear it out of the ground with a truck. The entire agave plant is then cooked down, hydrolyzed with enzymes, and converted over through other chemical processes into a fructose syrup. All this chemistry obviously has nothing to do with how pulque was originally made and how the agave plant was originally used. The use of these chemicals also puts any organic certification of agave into question. And that’s not the only problem, boiling down the entire agave plant may release toxic saponins present in the agave and yucca families of plants. These steroidal, abortive, and/or purgative compounds have not been confirmed to be present in agave products, however, exercise caution when using agave. In addition, agave products should be avoided during pregnancy until more research is conducted. If you select agave as a sweetener, only use certified organic clear agave of the type Ultimate Superfoods distributes (www.ultimatesuperfoods.com). Be sure to request that every company selling agave provide laboratory data that their product is free of chemicals, contains a low percentage of fructose, contains a high percentage of inulin, and is free of toxic saponins. Coconut Palm Sugar: This is now available as a sweetener. It is usually heat processed, yet unconfirmed reports indicate raw coconut palm sugar is now available from Balinese sources. It is processed using lime (chalk) or mangosteen sap to neutralize acidity. Because of the calcification problems associated with eating chalk and the magic associated with the mangosteen tree, mangosteen sap processed coconut palm sugar is preferred. Erythritol: Erythritol is made by breaking down plant starch into glucose. Then the yeast Moniliella pollinis is added to the glucose. Through fermentation, the glucose breaks down into erythritol. Metabolic, toxicological, and clinical studies covering areas as diverse as cancer, nervous system health, and allergic reactions have found erythritol to be safe. Erythritol has GRAS (generally recognized as safe) status in the United States. Seek out organic erythritol or products containing it. Inulin: A long-chain polysaccharide that is mostly too long a sugar to absorb into the blood stream. Inulin may be isolated from Jerusalem artichoke or properly processed agave. Look for inulin powder or Jerusalem artichoke syrup. Too much inulin intake can cause digestive distress in certain people. Lo Han Guo: A non-glycemic sweetener from Chinese medicinal tradition made from a type of wild cucumber. Lucuma: Lucuma’s sugar content is low. The percentage amount present in the dried pulp from mature lucuma fruit is: 8.4% glucose, 4.7% fructose, 1.7% sucrose, and 0.06% inositol. Maple syrup: this is the only sustainably-harvested, large-scale, forest sweetener in the world. Maple is likely the richest source of minerals found in any sweetener other than dark honeys and molasses. Look for organic maple syrup and maple crystals as an ingredient. Molasses: Select unsulfured, organic sugarcane molasses because it is fairly rich in vitamins and minerals and has been purported (like fresh sugar cane) to have “anti-stiffness factors” that break down detrimental calcification (see my book The LongevityNOW Program). Soak water: This is a natural sweetener from dried fruits such as date water, goji water, or dried fig water. Shop for organic dried fruit products and soak them in spring water for several hours to make your own fresh soak water. Stevia: I recommend dried powdered leaves over extracts. This is a wonderful and easy plant to grow. It contains no real sugar, so therefore it does not feed candida or cancer. Look for organic stevia products. Xylitol: This could be the sweetener of the future if it could be obtained with certified organic quality. Xylitol does not feed candida or cancer, but tastes normally sweet. Originally isolated from birch syrup; it is now available as a white powder. Yacon: An extraordinarily easy to obtain and abundant subtropical to tropical tuber, relative to the Jerusalem artichoke. Yacon is commonly available as dehydrated chips and as a syrup. Look for organic products. Yacon syrup is rich in iron and only mildly glycemic. Refined white and brown sugars made from beet, sorghum, or sugarcane of all sorts, primarily due to genetically modified crop contamination. Evaporated Cane Juice: Rapadura is one of the many names of this highly processed and highly heated product. This is almost pure sucrose, like maple, but lacks in minerals. Evaporated cane juice is known to aggravate all sugar-sensitive conditions from diabetes to candida to cancer. Evaporated cane juice can be certified organic. This product often sneaks into chocolate products, pre-made smoothies, and lots of vegan treats (because it is not processed with bone char). Sorbitol: This sweetener is typically made from genetically modified corn starch. It was originally isolated from stone fruits of the genus Sorbus.